Sledgehammer’s Centralizer Subs are used to allow the operator to run centering devices into wellbores where standard tolerance Centralizers are restricted due to Stop Collars not being capable of withstanding drag and fit limitations. Bow Springs can be supplied in almost any casing size, grade or thread and for use in the most challenging wellbore configurations. The Bow Spring Centralizer can pass through annular spaces below ¾” per side without compromising the centralizer’s performance in under-reamed hole sections. 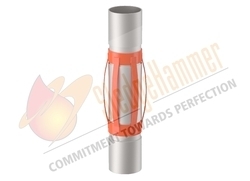 Sledge Hammer's Hinged Non Welded Stainless Steel Bow Spring Centralizers are special purpose centralizer, it's used where the chances of corrosion and contamination are present, or it can be use for water well also. It's a 100% stainless Steel Manufacturing along with stainless steel nails Premium quality Bows are made of stainless steel material and hot formed in totally controlled Heat Treatment Plant to achieve the uniform hardness all over and good spring action. Sledge Hammer's Slip on Welded Single Piece Bow Spring Sledge Chakra is mad one piece welded at one side. Premium quality Bows have high restoring force uniform hardness all over. Slip on centralizers are provided for direct installation pipe by slipping on. It has High tensile strength, high shock absorption value an impact value. 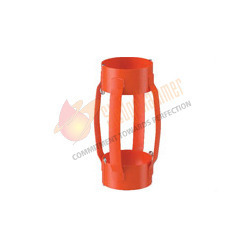 In welded centralizers, welding can never be as smooth as the sin piece centralizer. Welding always be little overlapped or little exposed which cal friction to fluid while running in the hole but single piece centralizer have smoc corner radius which allow better fluid by pass and have low friction. SledgeHammer's Welded Hinged Spring Bow Centralizers are high quality welded products, which meet or exceed API 10D specification. Welded Centralizer has more Restoring Force as compare to Non Welded Centralizer. The Centralizers have Bow Spring strongly welded to the End Collar under required temperature and condition with extra low Hydrogen coated Electrodes. Integral hinge folded on the inside stay intact even under extreme stress. The End Collars are designed with a Reinforcing Rib stamped into the End Collar to give maximum structural toughness. These generally shipped in half assembled condition for economy in shipping and storage cost. These Centralizers are available with combination of Bows configure from choice of seven standard Bow height for optimum Starting and Restoring Force. These centralizers undergo a special Iron Phosphate coating process to prevent from Rust then coated with special Polyester Powder. These are available in all sizes ranging from 3 1/2" to 20 ". Any special sizes or combination can available on request. Looking for Bow Spring Centralizer ?